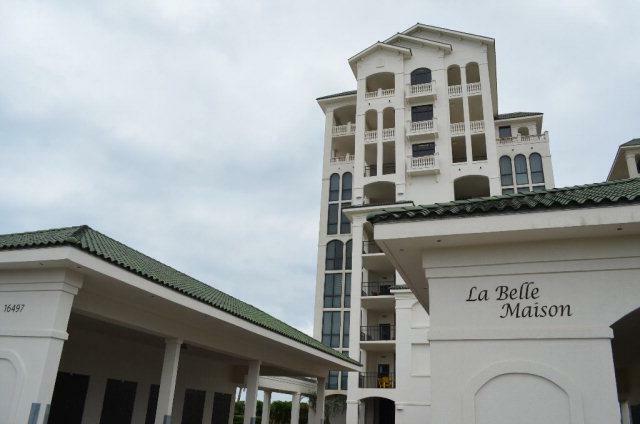 La Belle Maison Condo in Perdido Key FL. Very rare Exclusive and Private gated Luxury! Spacious 2520 sq. ft., Four bedrooms and Four and one half bath. Panoramic overlooking the beautiful blue waters of the Gulf of Mexico from huge wrap around balconies! Exclusive rent restricted privacy and low density only 14 units along with beautiful architecture like no other in the area. Large custom kitchen perfect for entertaining friends and family! Huge master suite with luxurious master bath. The North balcony overlooking Ole River and the perfect spot for breath taking sunsets! Two units per floor with two elevators. 10 foot ceilings with floor to ceiling wrap around windows. Covered assigned parking. Gulf front pool and hot tub. Secure elevator entry. Assigned storage units.This is truly a must see condo for the discriminating buyer!